The New York Stem Cell Foundation (NYSCF) congratulates Shinya Yamanaka, MD, PhD, at Kyoto University in Japan, and John Gurdon, PhD, at the Gurdon Institute in the UK, for being awarded the Nobel Prize in Physiology or Medicine by the Nobel Assembly at Karolinska Institute. Although almost fifty years separate their discoveries, the scientists share the prize for their stem cell research breakthroughs. 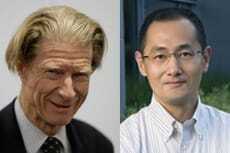 Both Yamanaka and Gurdon showed a mature cell could be reprogrammed into a pluripotent cell, a cell that may become any cell type in the body.